Falling in love comes instinctively among the northwest Highlands of Scotland. I know, I’ve just been seduced; caught in the trap of the common or garden holiday romance. But this is no Shirley Valentine rom-com or drunken nightclub fumble, this is one of those moments when the temptation is to throw an emotional wobbly, leave everything behind and elope to a new life. It’s the overpowering beauty of the landscape and seascape surrounding Torridon and Applecross that has brought me to my knees. And as I sit on a rock outside Monty Halls old bothy from his BBC series ‘Great Escape’, gazing across a sun-kissed Inner Sound at the might of the Cuillin Hills, I want to follow in his Land Rover tracks. As so many cash-rich, time-poor, middle-class English people have done before me, I’ve fallen for the idyllic charms of Scotland’s west coast. I begin to imagine a new life among the lochs and Munroes, crofting an existence that somehow involves riding a bike everyday, kayaking across a narrow slit of water for a pint of milk and the paper, and sipping a cup of tea while drinking in the view of sea, sand and mountain. Even via the medium of television the magnetism is immensely powerful, so much so that traffic to the Applecross Community website apparently grew 1300% immediately following the airing of Monty Halls’s series and phones at local estate agents rang off the hook as escapist viewers enquired about local property. Of course, like all holiday romances, the reality is a long way removed from the fantasy. What the programme makers didn’t reveal was that the series was filmed during a localised heatwave and, according to one local taxi driver we got talking to, Monty barely even spent a night at ‘Beachcomber Cottage’ before eloping down the road to the local hotel/gastro pub. And, while the hypnotic allure of the whole adventure was undoubtedly enhanced by the amiable and relentlessly cheery host, it’s unlikely a man of even Halls’s considerable spirit would survive too many isolated years of midge-mauling and winter drizzle. The path that brought photographer Macca and myself to this bipolar paradise was as delicious as the landscape that surrounds it. Until the coast road was built in 1975 the only access along the Applecross peninsula, from Cruary to Sand, was a rough track over the Gualainn, or shoulder. 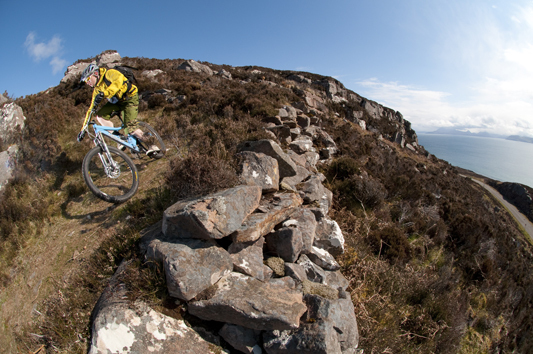 Appropriately it was constructed to a high standard – with the stone path ‘floating’ on the peat in the manner of traditional crofter’s paths – and now, with considerably less traffic to support, it has contracted into a beautiful stretch of singletrack that ascends gradually from Applecross Bay and sweeps across the clavicle of the coastline affording stunning views across Raasay to Skye. We’d just left our hosts, Go-Where’s Andy and Aneela McKenna, heading back to retrieve their transport, giving us enough time to explore the path to Sand and spend some time relaxing on the beach. So far our little excursion was paying off, big time. As the golden beach, tiny bothy and MOD outpost at Sand approached, the path begins a shallow descent. After a stone bridge and a brief rise, it made a sudden break for the coast, tacking across the hillside in a series of hairpins before a brisk climax that brought tears streaming from our unshielded eyes. I’m not sure whether Monty rode a mountain bike but, when the ride home from the pub is as good as this, he damn well should have. The pub in question is the Applecross Inn; a local of some repute. 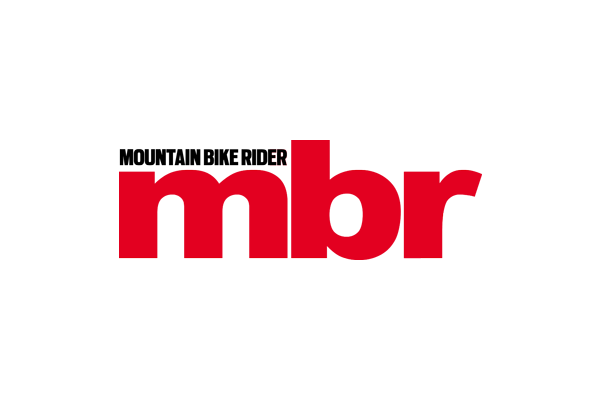 It’s a refreshing rarity in that it doesn’t rely on its monopoly status for business and actually serves up the kind of quality, locally-sourced cuisine that befits the surroundings. The prawns, for instance, are kept alive in a barrel in the yard. Which is one reason the tavern’s speciality – a half pint of the critters – is such an essential culinary experience. However you arrive, reaching Applecross is no mean feat, and certainly deserving of a pint, whether you prefer your glass filled with ale or crustaceans. 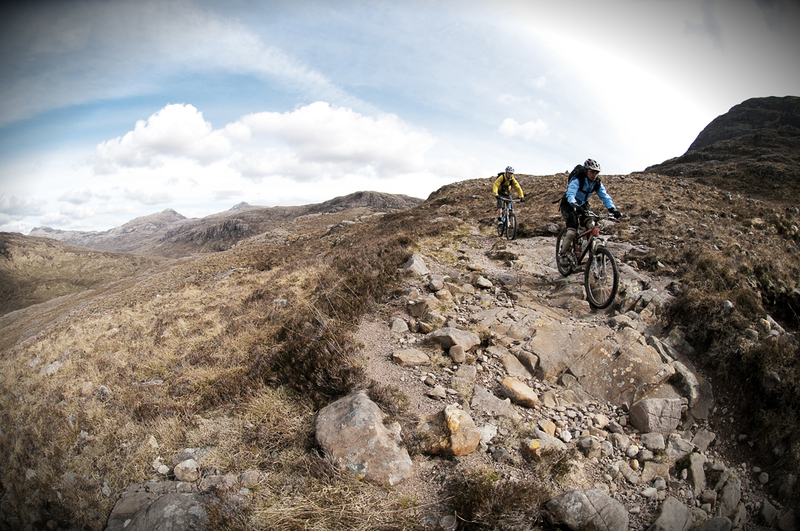 The most popular route is over the Bealach na Ba or ‘Pass of the Cattle’. This tortuous 2000ft passage is the closest you’ll get to an alpine pass in Britain and still regularly gets blocked by snow and, less glamorously, overambitious caravan drivers. 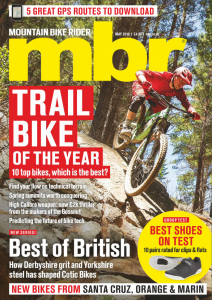 It’s as easy on the eyes as it is tough on clutches, but astride a mountain bike it offers no escape from the tarmac, and with a lack of width and an excess of traffic, it doesn’t even make for an appealing road climb. Much more rewarding is the long approach from Kenmore on, what would have been, the old corpse road. Fortunately the only thing funereal about our trip along this ancient path was the early pace as we climbed away from Andy’s ‘Go Where’ van and trailer up the slopes of Meall Dearg. Early sleet, snow and hail had finally given way to some sunshine and, as we progressed along the initial stretches of heather and gorse-lined singletrack, gaping blue skylights opened up in the cloud. 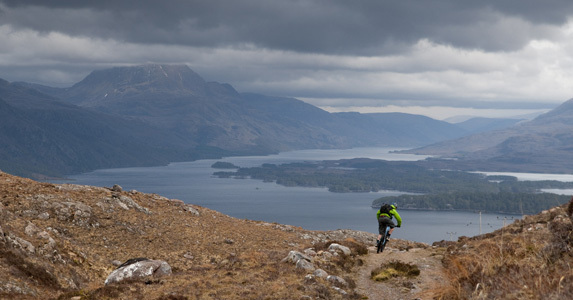 Go Where is a new venture that aims to deliver the incredible riding experiences offered throughout the Scottish Highlands without any of the logistical and practical inconveniences. “Go Where is a facilitator; it can be as much or as little as you want” explains McKenna who already owns and runs Innerhaven; a popular bike-friendly accommodation in the Tweed Valley. “We can provide everything from fully guided tours, to a bare-bones taxi service that drops riders off at the trailhead and picks them up at the end”. The service effectively eradicates the long road sections that inevitably link great trails, and make up most of the return legs back to vehicles or accommodation, maximising time on the amazing singletrack of the area and minimising unnecessary roadwork. Guests can also exploit McKenna’s encyclopaedic knowledge of Highland trails to tailor their trips according to mood and conditions. It’s a unique and flexible approach, but one that we can certainly see the benefits of, particularly when, for most people, a trip this far north is a time-consuming business. 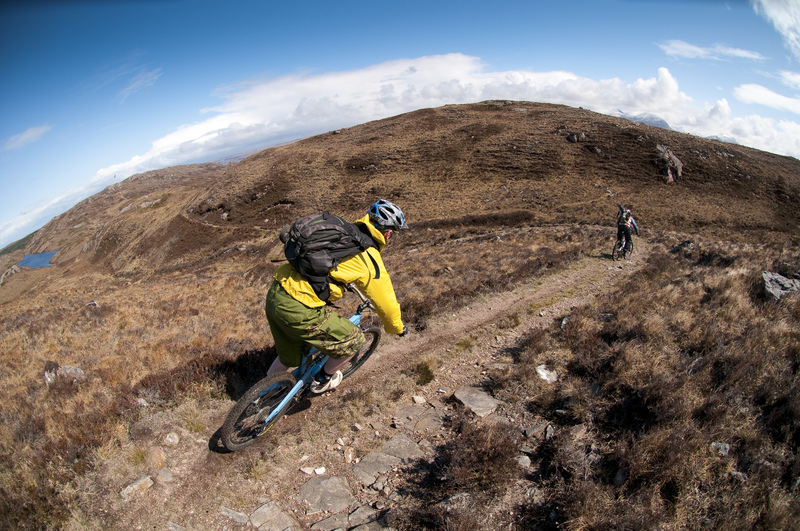 The climb is enjoyable thanks to a steady gradient and the frequent technical challenges it offers and before too long we are ripping passed Loch Gaineamhach, carving sweeping turns and leaping culverts built to drain water away from the path. Aided by a steady tailwind we pushed on beneath Croic Bheinn with near effortless progress. In parts rocky and technical and in others rutted and peaty, with the grassy clumps forming natural doubles and rhythm sections, the trail was a constant delight. Then we crossed a sturdy bridge and the ground tipped away. A perfect trail clung to the hillside, contouring across its torso in alternating slugs of blistering pace and puckering challenge. A great glen opened up before us with Applecross Bay and the mighty Cuillin mountains of Skye framed between its walls. Who said Moab had a monopoly on slickrock? Our second day delivered the kind of weather system normally reserved for visiting BBC film crews, namely unbroken sunshine and a deep blue sky that provided the perfect keyline to the fresh snow on Mullach an Rathain, Spidean Choire Leith and Stuc a Choire Dhuibh Bhig. More formidable a vista it would be difficult to envisage in the UK outside of the nearby Cuillins, yet even Skye would have a tough time out-posturing the peaks of Liatach and Beinn Alligin with their near vertical faces tumbling, without a pause, 3500ft to virtually sea level. The combination of sea and mountain gives the area more than a passing resemblance to the Norwegian fjords, while the peaks themselves, particularly sugar-coated as they were during our visit, could have been excavated straight out of Yosemite. It was too good an opportunity to pass up for Macca so, after dusting off his Ansel Adams filter, we spent a good portion of the morning shooting cover shots on the lower slopes of Liatach. With this duly fulfilled we started the long drive round to Coulags, via the quaint fishing villages of Shieldig and Lochcarron, where we would start the second day’s ride. The plan was for Andy, Aneela and myself to ride in from Coulags on a trail that leads over a sizeable mountain pass almost to the door of our hotel bar. Andy McKenna would drive the back to the hotel and ride out to meet us, hopefully joining up somewhere in the middle. 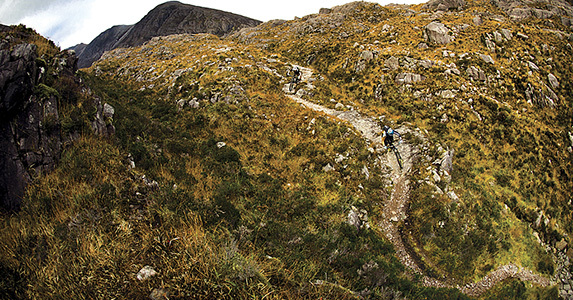 We crept up the glen on rocky singletrack that tested balance and technique far more than fitness. The trail was in great shape considering the wilderness surrounding it, no doubt helped by the excellent stone-pitching and numerous culverts that are slashed through the trail at every opportunity. This is one path where you need the ability to pick your wheels up without interrupting your pedal stroke or, failing that, a source of cheap inner tubes. Despite the mild irritation of drainage ditches, progress was good and we soon passed an orderly bothy and began tackling the less-refined leg up to the bealach, or pass. Movement stuttered and stalled and it seemed to take as long to ascend the last few hundred metres as it did to complete the first five kilometres. We reached the saddle between Meall Dearg and Maol Chean Dearg and Macca began waxing lyrical about a trail that forks off to the north east whereupon a buff, high altitude, ribbon of quartz-topped singletrack opens up. It was the kind of description that almost provoked a mutiny, but we persevered with the designated route and were soon rewarded with a trail that peeled away from the bealach and contoured around the hillside to Loch an Eion with virtual perfection. Smooth, sweeping bend after smooth sweeping bend – for the most part devoid of culverts – linked arms all the way to the water’s edge. 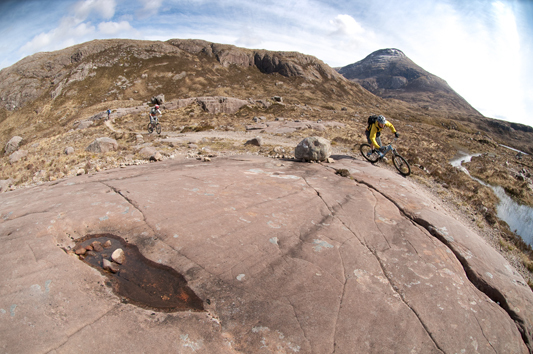 At which point the Torridonian sandstone lay out before us like a slickrock moonscape. Andy sums up the moment; “It’s such a phenomenal place”. When you go past the loch and turn that corner, and the landscape just opens up, I don’t think there’s an awful lot of riding that comes close”. Only a further 6km down the trail, as we dropped toward Annat, did the cobbles emerge with such prominence as to temper our enthusiasm. That evening we toasted the magnificence of this corner of Scotland, and the world-class riding it delivers, in the traditional manner; with a tour of the whisky collection. Fortunately, for our livers and our wallets, the Torridon Hotel’s whisky bar, and its 350 varieties of single-malt, was closed for a Mazda press launch or it could have been a very long night. And after a few wee drams, while the others packed their bags, I stole away into the dying evening light, and ambled down to the placid shallows of Loch Torridon. For a few minutes I embraced the glowing sky, the dark silhouettes and the absolute stillness. I burned a snapshot of the scene into my memory, and watched the sun set on a holiday romance. Yet I knew in my heart it was the start of a much longer relationship. Go-Where’s flexible approach means pricing can vary considerably depending on the level of support, duration of trip and numbers of riders involved. Trips are offered right the way across Scotland, from the Borders and Dumfries and Galloway to the Black Isle and Torridon. Group size can be up to twelve using the Go-Where Transporters and trailer. For more details visit the Go-Where website www.go-where.co.uk or call 07713 151773. Look beyond the corrugated iron cladding of the Whistle Stop café in Kinlochewe and you’ll find a warm and welcoming sanctuary with superb home-cooked food. Proof that you can’t judge a book by its cover. Tel 01445 760423. For lattes and literature head for the Mountain Coffee Company in Gairloch. Tel 01445 712316. For the nearest bike shop you’re probably looking at Inverness. In other words there aren’t any. Take everything you need with you.